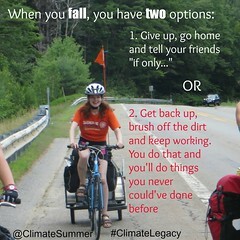 This was Sara’s speech to everyone at the Climate Summer final party. 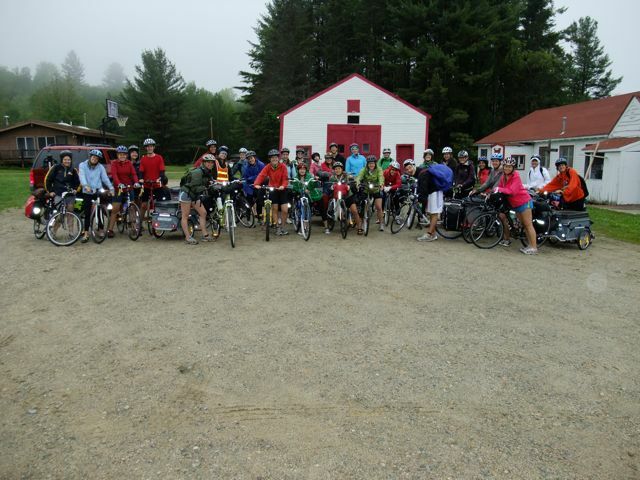 All 31 of us in Wilmot, NH! 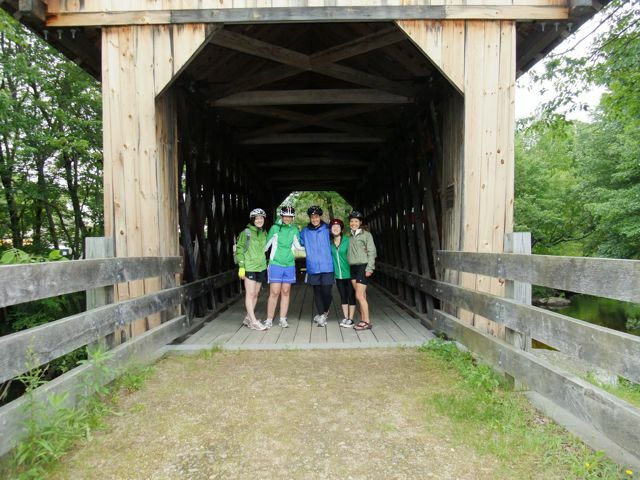 Team Mass Acceleration is a compilation of geographically diverse individuals from Beverly to Seattle, but we all arrived in Wilmot, New Hampshire with the same excitement and drive for a summer of many unexpected and unknown experiences. Some of the distances and inclines we conquered this summer, from George St. in Worcester-a 24% incline- to climbing the mountains of Western Mass, were not ideal for 5 women who had never biked more than 10 miles. 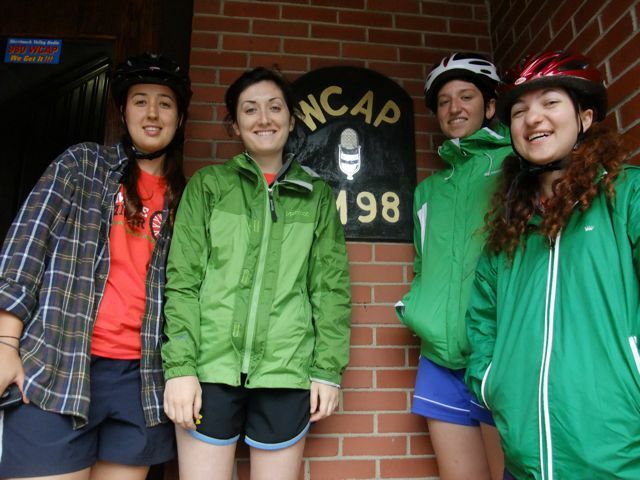 This summer we biked 700 miles to Lowell, Newburyport, Salem, Waltham, Worcester, Springfield, and Winchester. And we witnessed our own strength and resilience. A determined group of individuals working to enact change in our own lives and influence the lives of those we met. Along the way we fed off one another’s energy, companionship, knowledge and friendship. This was certainly true this summer; unlike summers I’ve had in the past of working a less than fulfilling job. We only took two days off the entire 10 weeks, even though we were highly encouraged to take a day off each week. All 6 teams have an unrelenting dedication to get on their bikes everyday. We understand that we can no longer sit idly when there is an opportunity to shift the way our society produces its energy to cater to our every day lives. Those every day lives that we gave up this summer, do NOT include traveling hundreds of miles with two 75-pound trailers. We were reminded frequently this summer it is not normal to have occasional showers, live off 5 dollars a day, and find sleeping on tiled floors comfortable. 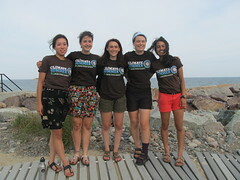 We woke up early every day and ate, biked, thought about eating, emailed contacts from our next town, and worked. This summer we never truly complained, but rather adapted, joked, and made the best of our unique tan lines. We also appeared on television with no concern whatsoever of when we last showered or how dirty our minimalistic wardrobe was. We do not expect anyone to live as we did this summer, nor do we judge anyone who continues to live with the simple luxuries we once did. Next week, we will no longer be biking, nor nomadic. We will return to our former routines: we will shower, do laundry, and go out to eat occasionally. But we will also question our habits and make conscious decisions about our lifestyles. one of our media hits! Mass Acceleration has come to realize that the way our society transports itself will never be the way we lived this summer. Traveling solely by bike & living off of $5 dollars a day was meant to raise questions and possibilities, not be promoted as the new alternative. We are not all perfect in our sustainability practices, but following our morals and imaginations can broaden conversations and solutions. We all struggle, but we struggle together. This gives us common ground. 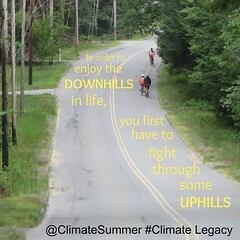 My teammate Sam likened this summer’s journey to carrying the weight of a 75-lb trailer up a hill. Just as everyone in a community has different interests and motives for entering the environmental movement, my teammates and I had different challenges when pulling the trailers. But when someone reached their limit, when they simply couldn’t bike up another hill with the extra burden, we passed on the trailer to our next teammate and continued biking. All five of us on our first bike ride together! There were times when the relief of four other exhausted yet inspired teammates reminded me of the unyielding influence of our collaborative passion, voice and bond. Mass Acceleration overcame falls and fears, from Eliza’s epic tumble to Alyssa’s countless topplings, to close encounters of every kind of critter to tornado warnings, never ending mountains, and inevitable bike breakdowns. Support is crucial on a team, just as in a community, just as it is in a society. Our team’s journey this summer encompassed a lot, from eating Eliza’s Nutritional Yeast to learning the inner workings of grassroots organizing. 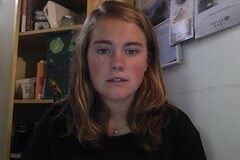 We experienced both the extremes of sitting in the Massachusetts State House waiting to testify for the regulation of Coal ash to gardening, where we lathered ourselves in dirt. The invitation to have a pizza party with the Mayor Joe Obrien of Worcester was made possible by the power of our team, an assertive, youthful group with a powerful message. We encountered various other situations this summer that I am certain would not have happened without our clear goal, teammates, program name, and community partners. Mass Acceleration met the Indigo Girls and was introduced at their concert, rang a Paul Revere Bell, and met with various government officials along their journey. Our media attention this summer also astounded me, and the generosity of individuals who comforted our hungry stomachs and cleaned our dirty laundry never ceased to amaze. The changes in the communities we saw displayed the wide range of actions our society needs to take. Our nation must engage in a widespread transformation. We’ve worked with agricultural groups and recycling incentives in every town. We worked along side low–income and at-risk youth who transformed their lives to create a better future for themselves and their community. 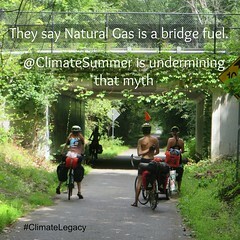 We saw a green business incubator in Springfield find hope in working alongside an alley of gasoline products, showing the juxtaposition of fossil fuels and gardens. We witnessed the successes of organizations devoted to shutting down a toxic coal plant in Salem and preventing a proposed biomass plant in Springfield. We picnicked at a Catholic school with a wind turbine, and worshipped with a priest who wore a wind turbine along with his cross. There have been individuals committed to changing their lifestyle with renewable technologies in businesses and homes. And we’ve seen the small town of Winchester take on the extraordinary task of turning solar viral in their community. There is still much left on the bike rack in our efforts to create the best possible future, but Mass Acceleration will now have the tools and experiences to keep pedaling up hills that seem to push us in the opposite direction. Traveling and connecting to my teammates and the community partners I worked beside will forever remind me of the ever present companionship of others who share similar hopes for the future. Undoubtedly there will be times in my own life that I will seek motivation from those who are working in a different community, fighting from a different angle, but nonetheless, part of the same movement. Beyond steep hills and countless miles, I established connections that will continue to influence me and persist onwards while propelling the movement forward. 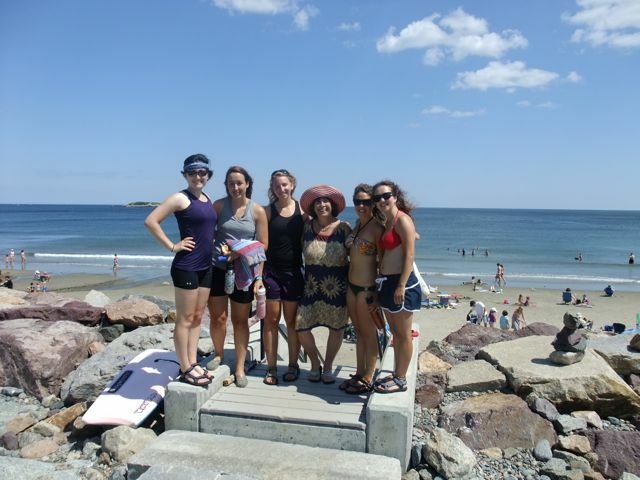 This entry was posted in 2011, Team Massachusetts and tagged 2011, biking, climate summer, Mass Acceleration, new friends, reflection. Bookmark the permalink. Well done friends! May your next steps/ peddles in this life be graced. Thanks for inspiring all of us! peace.